My latest sailing trip came with a slight surprise: Although I knew my fellow crew from previous sailing trips on the Pogo 40 I didn´t knew that both were vegetarians. It wasn´t that they had forced me into this, but I felt it being inappropriate to being the only meat-eater on the trip. I volunteered to give up meat and products of meat for the duration of our sailing to the Island of Bornholm and back: One week without carnivorous behavior. We all know that the ship´s cook is the second most important figure aboard a boat: If food is bad, crew mood will be bad and the fragile social order will soon deteriorate. Ships function by a strict hierarchic order. If spirit breaks down, a crew is lost. Being provided with sufficient, plenty and tasteful food is the way to keep your crew together. Skipping meat therefor means a lot for the chef in the galley. Cooking veggie means to rely solely on vegetables. 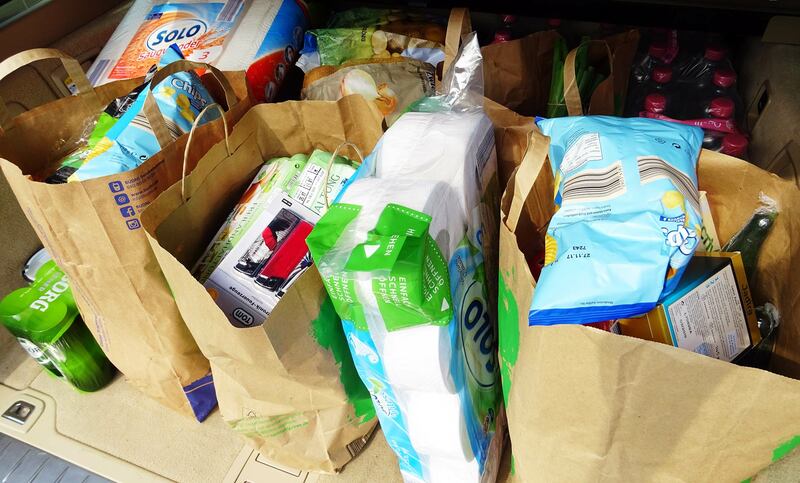 When doing the provisioning, you should choose wisely between fresh and durable vegetables, like canned food. First of all, there is the freshness problem: Vegetables are perishable and some of them are reacting very fragile to moisture, some even to moist air, to pressure marks (there´s always a lot of violent rocking going on) and light. So storage of fresh veggies is a challenge. 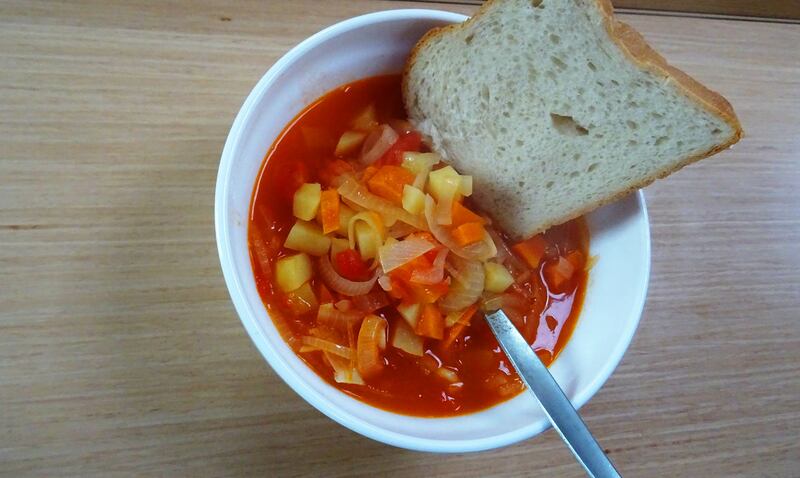 Very easy and forgiving vegetables are potatoes, onions, carrots, celery and pepper. Zucchini, aubergines or tomatoes are potential troublemaker as they will rot fast and are very fragile in nature. 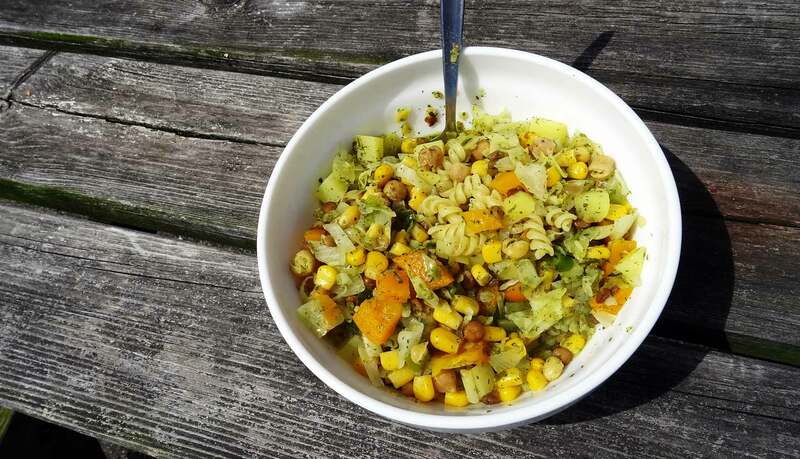 Basic food supply for the vegetarian sailing trip should also consist of the filling stuff carrying the most amount of carbo-hydrates like Pasta and rice. But you have to make some variations because eating Pasta or rice for a whole week (or even longer) will kill your crew´s sense of taste for sure. 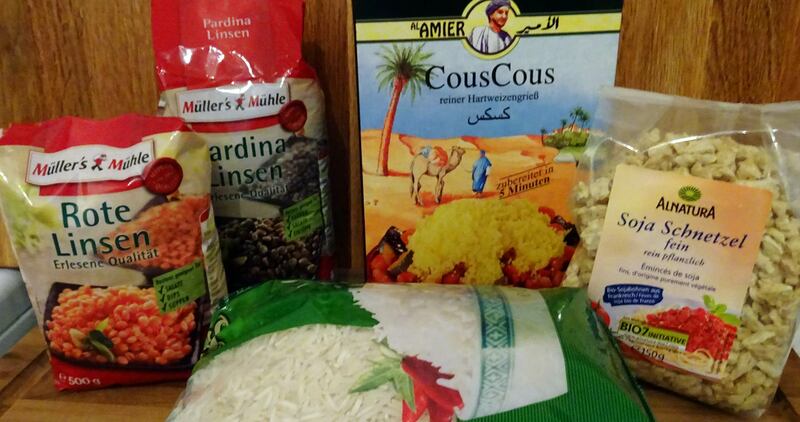 Try “exotic” stuff like Couscous, lentils (leguminous plants in general are perfect) or Polenta. Those make for a great tasting variation in the basic ingredients of the meals and besides, together with the right spicery, a good chef will also provide for a tasteful trip around the world. And of course there´s the canned vegetarian food no sailing trip can skip: Tinned tomatoes (never ever forget to take enough of these! ), pre-cooked veggies like sweet corn, peas, carrots, chickpeas, asparagus, black salsify and whatnot. Get the whole damn shelf from the supermarket – the more variation, the more colours on the plate, the better! Besides the challenge to the ship´s cook to come up with new recipes and provide for a variety of new dishes and tastes, skipping meat has also a very serious implication on the metabolisms of the crew. Meat, generally speaking, is a great source of energy. We all need energy, especially when sailing, as controlling a boat is energy-intensive work. An average adult has a basic metabolic rate of some 1.000 to 1.400 calories per day. If working and undergoing stressful labour, this amount can rise to 2.500 to 3.500, sometimes even more, calories. Now compare: A steak of 250 grams will deliver some 700 calories. A steak alone! For the same amount of energy you may eat 700 grams of potatoes! So basically speaking, it´s perfectly clear, that by skipping a very dense source of energy your crew will eat bigger amounts of food. You will just have to cook more stuff, believe me! 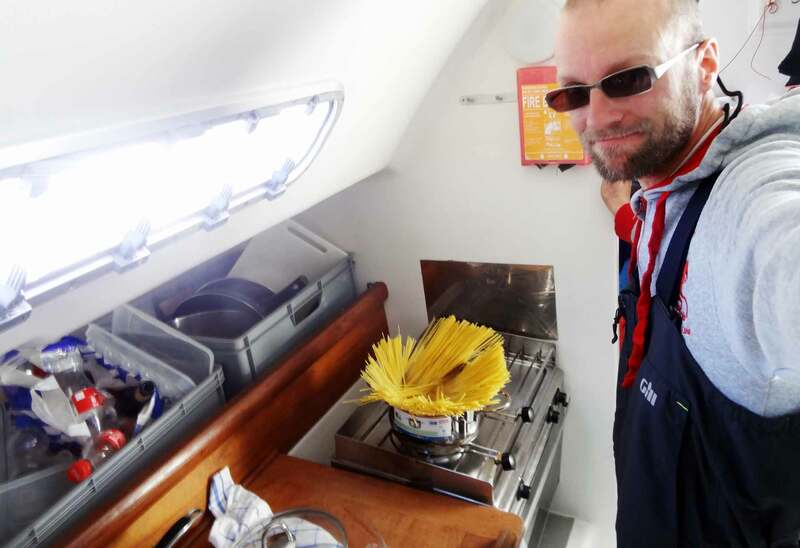 I couldn´t get it at first but on the first two days I did had the feeling that I hadn´t provided enough food for the crew as the pans and pots were emptied and spooned clean to the bottom. As a newbie vegetarian, you will eat tons of stuff! This given, it also implies that your whole digestive system will also change. That is something I had to realise during the sailing trip. Even if it may sound disgusting, passing gas will be your new occupation, believe me. You also skip beloved habits. A lot of. On past sailing trips, I used to have these little Salami and sausage-packages where to grab one or two and have them as a snack. Now that´s gone. 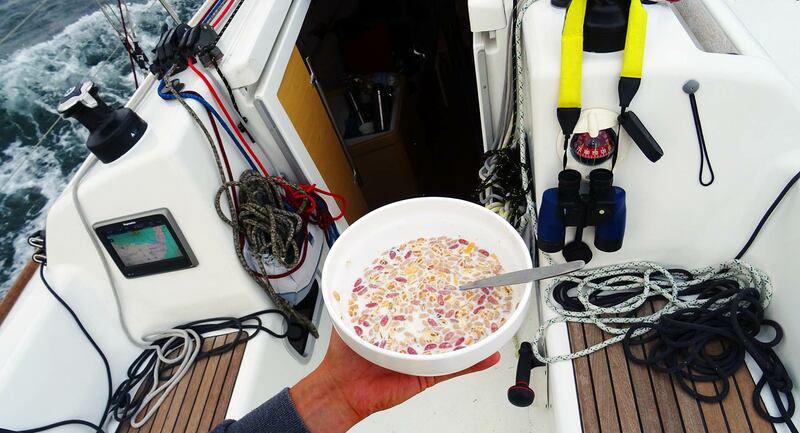 A tradition on sailing yachts is the breakfast: Normally, huge piles of scrambled eggs with kilograms of bacon will be served. No more when veggie sailing. I learned that a big bowl of cereals (I usually do not like cereals – cold food in general – in the morning) will fill your stomach sufficiently but will also deliver the energy needed to live through to the lunch. Honestly, we didn´t skip eggs (but I made sure I bought Bio-quality eggs of course!) and believe me, if you serve scrambled eggs (without bacon, but with lots of fried onions and baked beans) just every third day, the scarcity of this particular dish will cause a great “Hiya!” from your crew! I love being skipper. But I also love being the ship´s cook. Instead of meat based snacks – I loved providing myself with a fast-made whole wheat-sandwich with a some slices of sausage – you just get a variety of cheese. Hunger will get even the biggest cheese-spurner like myself so deperate, that you just put on a centimetre-thick slice of cheese between the bread and will love to munch it in the cockpit, no matter if meaty or not. I also made good experiences with apples. Three or four apples per 24 hours is a perfect source for sugar (energy! ), liquids and vitamins of course. Cooking is an act of love. If a ship´s cook (a cook in general!) does not love what he does, the dish won´t taste good. Yes, you can taste a good motivation and the love that goes into providing a meal. So, if skipping meat makes you depressed, don´t fall for it. Be open, try out new things and be enthused by the fact that no animal whatsoever had to be abused, tortured and cruelly slaughtered to contribute to your meal. Be happy about the fact that no single Cent is flowing from your wallet to the meat industry giants. That´s a good thing to do! So, let´s rock the galley and cook a nice, healthy and tasty meal – and this means first of all and especially with veggie food: Whittling stuff. You need a sharp knife, a durable underlay, not-shaking hands and yourself being safely wedged especially in sailing heeled to chop all the carrots and potatoes and stuff to smaller parts. Remember: The smaller the chopping the faster the cooking! But be safe as well, your fingertips won´t be the first to be sliced off by a sharp knife in a moment of inattention. Chopping time is also a great chance to delegate some of the work to other crew members off duty: Especially with bigger crews that´s a way to spare work for the chef himself and besides a chance to get to know each other better. Quite a nice heeling angle: Caution whilst cooking! Working in the galley down below can on the other hand be very tedious for another reason too: Seasickness. If the boat is going through even light moved seas, staring down on a cutting board can cause nausea, so be aware of this chance. 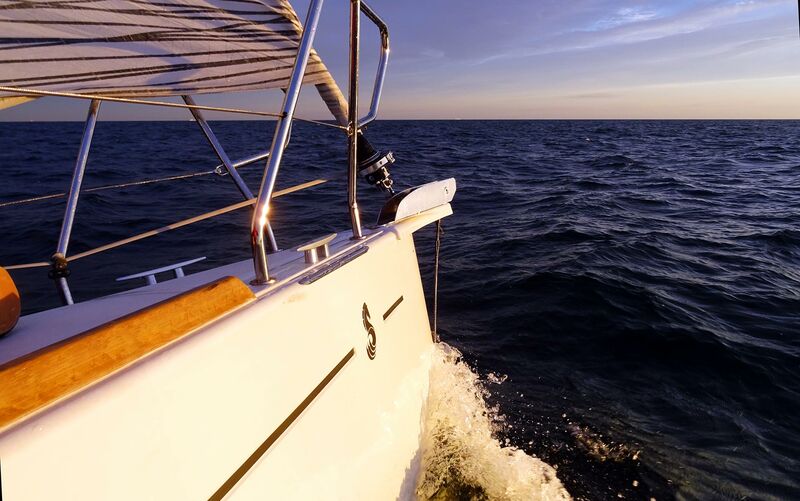 Sadly, you cannot move the stove out to the cockpit, so if you are seasick (and that really is a serious condition), pay close attention and if work is too nauseous or dangerous, tell the skipper to pass the duty on to another crew member for that matter as the better choice. Now let´s cook! Veggie cooking – that´s my experience – is more about exciting new stuff to eat and a chance to do some experiments. I never tried to substitute meat because I think that´s the wrong way to face vegetarianism. Instead, I always search for new combinations of basic ingredients, spices and tastes. But even with classic recipes, skipping meat is easy: Take fried potatoes. I just add more onions, some chilli, lots of red pepper and – if available – more of parsley in the end. The fried onions will provide for roasted aroma which triggers saliva production and the digestive system as a whole. The crew won´t miss meat, believe me. The trick is: Spices and onions. No, that´s true, onions is the basic ingredient in vegetarian food for sure. I remember reading on of the Golden Globe Race-books (Moitessier or Knox-Johnston – I don´t remember exactly) and there the protagonist praises his hundreds of kilograms of onions taken with him on the circumnavigation. This vegetable is full of vitamins and other nice things and it is so versatile on the other hand: If sautéed slowly, onions will turn very sweet which makes a great taste. Fried fast with a lot of heat, they remain a hard texture and develop a lot of roasted aroma which will predominate the meat craving and completely surpress it. The other thing is spices: Normally, salt and pepper will do. But with veggie sailing, you´ll need the whole variety of dried spices. And why not take on some pots of fresh herbage? Onions may not just exists as a sideline, they can also play the main character of a whole dish. Like French Onion Soup, a very nice recipe I love. 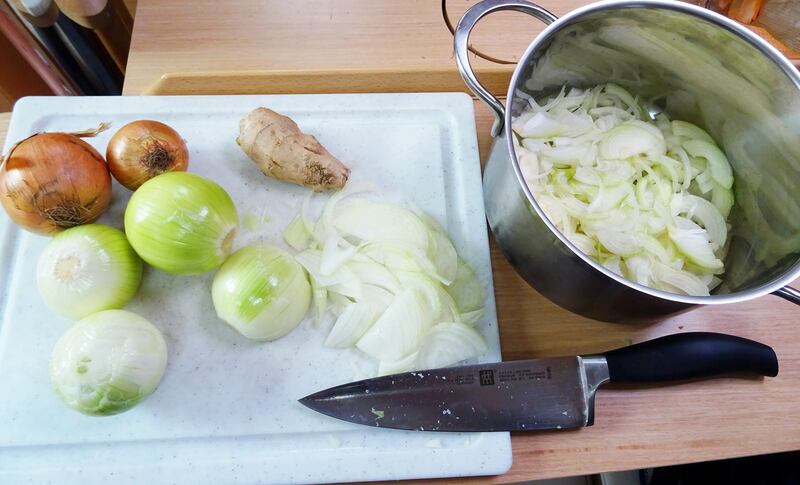 It goes as following: Just chop a truckload of onions into thin slices out of the peeled halves of the vegetable. 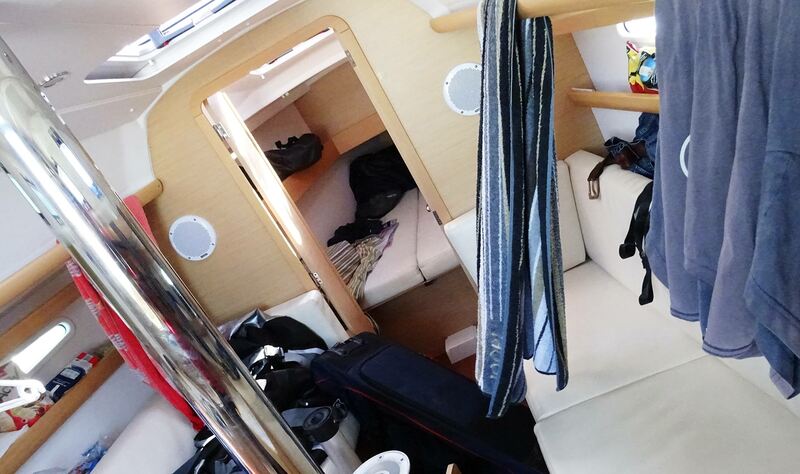 Be aware of the sharp odours which can make a whole crew down below in the saloon crying. You really need a lot of onions to be peeled and chopped, for a crew of just three people I was peeling close to one full kilogram! 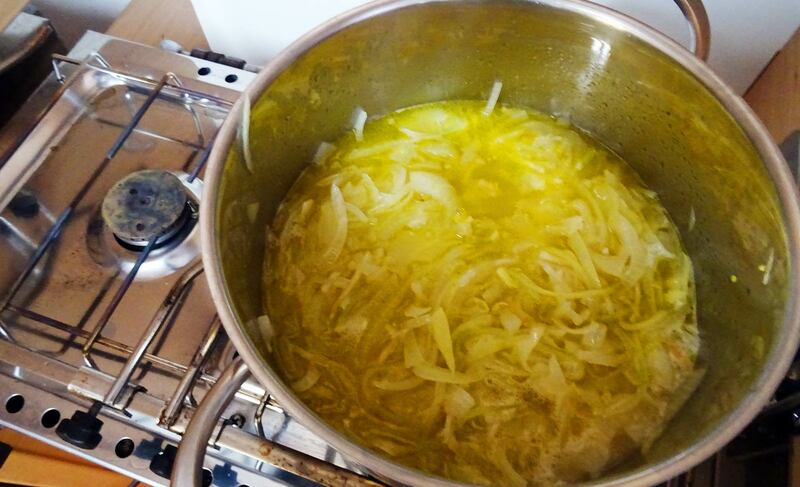 Then have the raw onion slices sautéed in a large pot but don´t pour in too much oil. As the vegetable itself brings on a lot of moisture, we don´t want to cook them, just get out a little bit of roasted aroma. When the onions turn transparent, add white wine and a dash of caraway (I like to cut the dried caraway with a knife for not having the big, hard crumbs in the dish later). Let this simmer for a while on the small flame. 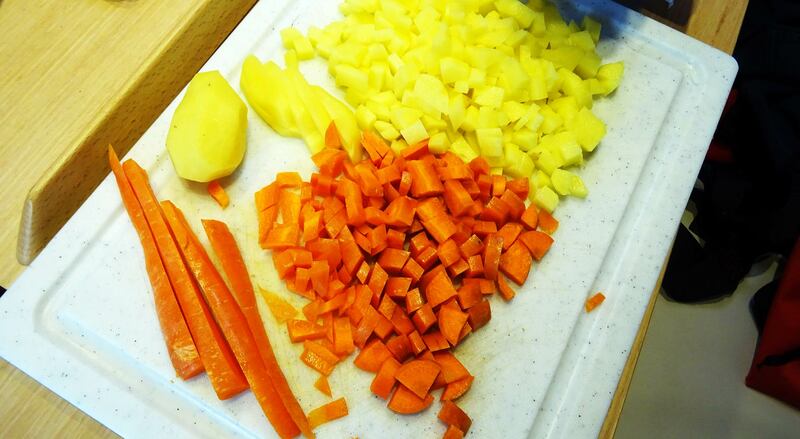 After some 10 minutes, add small cubes of potatoes and carrots (three fourths of potatoes, the rest carrots) and water. Salt, pepper added when done. Shortly before the soup is ready, you all either cream, Crème Fraiche or just milk (with a large portion of butter) to have the soup thickened and enriched with fat. I know, I know, milk and cream is an animal product, but I believe if you buy Bio-quality, damage done will be minimized. Adding parsley, fresh or dried thyme (just not too much!) and tarragon will boost the soup to a culinary highlight. Serve the soup in large bowls with thick slices of fresh white bread – it´s a treat, believe me, to sit in the cockpit and spoon the hot contents. Enjoy your meal, sailors! Best thing: If you made too much of the soup, you can stretch it to a new full meal by just adding canned tomatoes and Italian spices like basil and oregano – the “same” dish will acquire a new taste and can be served to the next watch as a new soup with a completely different taste. That´s another pro for vegetarian cooking: The next spice will turn the same ingredients to a new and different dish and taste. Feeling safe with the classy vegetarian dishes, you might try out new tastes. This can really boost crew´s mood because a whole new world of tastes and flavour-experiences will be the cause for vivid discussions and tasteful sensations. I am personally a great fan of Arabic food in all sorts. I just love it to work with Taboulé, Couscous, Harissa and all sorts of exotic spices. 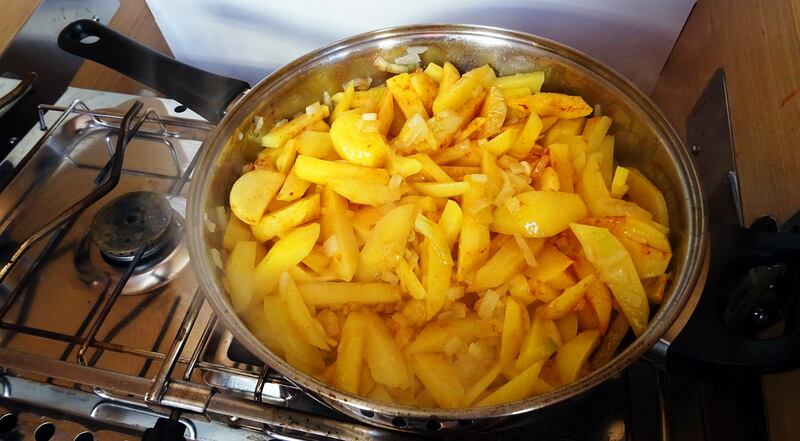 Even trying to mix salty and sweet stuff, cooking with fruits and other things turn to be pure magic on the small two-flame stove in your boat´s galley. 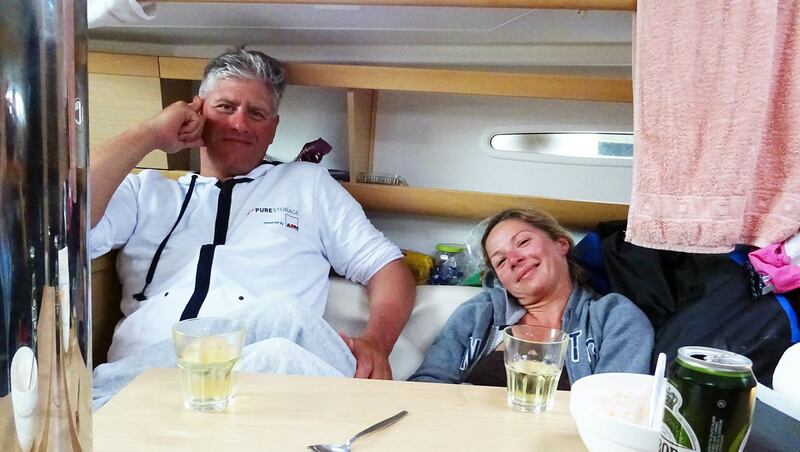 In the end, I´ve managed to skip meat for the duration of our sailing trip of 7 days with ease. I must admit, sometimes I craved the taste of meat (especially Salami on bread), but with creativity and spontaneity it was perfectly possible to provide for tasty and plenty of food to not just fill the stomach but to enjoy. Live clean and healthy and having the knowledge that I do not contribute to the utter cruelty done to animals and to finance the big meat producing industry with all the social consequences is a plus that felt good for real. I don´t know if my vegetarian cooking experiments were really satisfying to full-time vegetarians like Jens and Lena, but at least they were so kind to eat what I´ve provided and sometimes even praising my cooking expertise. But as it is with real life, not every dish you try will earn applause, but as long as you keep on trying, maybe read some fine cooking books and remember that cooking means loving, you will get better and succeed in going on that path. Can I stick to the vegetarian idea? Which I do: I didn´t bought a big fat sausage right after arriving back from our sailing trip. This experience really changed my attitude towards food, eating, clean life and doing something. It´s so easy to criticize “the system” or the “powerful above”, to bleat and be loud and be “against it”, but what this sailing trip and trying out some vegetarian dishes was really teaching was that I can do something about it: By redirecting my money from the big industrial players to veggie- & fruit producers (mostly Bio-quality, I do not want to reroute the money to Monsanto, Nestle & Co). And I won´t skip meat completely: Every second week I am going to buy a local grown Bio-quality piece of good meat and celebrate preparing and eating this. As a highlight. All the rest is vegetable, preferably locally grown, not flown in from afar. Besides great new tastes, that´s the real learning from my experiment.